Freehold: Sheriff Shaun Golden is pleased to announce that the Monmouth County Sheriff’s Office will be participating in National Prescription Drug Take Back Day on Sept. 26, 2015 from 10am to 2pm. 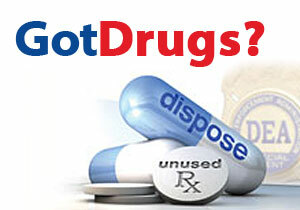 That’s the day to dispose of unused, unwanted and expired medicine. This year, the sheriff’s office will be hosting two drop off sites located at the Monmouth County Sheriff’s Office, 2500 Kozloski Rd., Freehold and at iPlay America, 110 Schanck Rd., Freehold. A sheriff’s officer will be present at both locations. “iPlay America is committed to helping the community. By supporting the Drug Take Back program along with the Monmouth County Sherriff’s Office, we help to make certain that prescription drugs are properly disposed of and kept out of the hands of someone who might abuse them,” said Jessica Schwartz, Director of Marketing and Promotions, iPlay America. In addition to participating in National Take Back Initiative, the sheriff’s office has a permanent collection site, located at the front entrance to the Monmouth County Sheriff’s Office, which residents can utilize Monday through Friday from 8:00am to 4:00 pm.